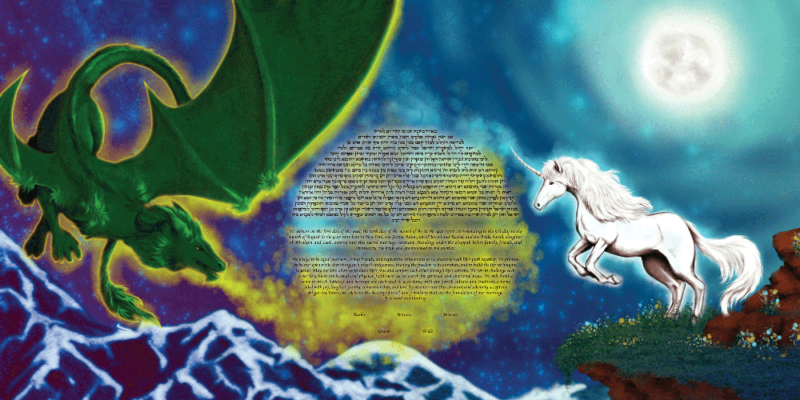 Moonlit Fantasy is a first-of-its-kind Ketubah representing the mixture of the sacred Jewish tradition of the Ketubah with the surreal über-universe which we call, the Moonlit Fantasy. The Moonlit Fantasy is a unique mixture of the real and the imagined, of the standard and the traditional — bringing the unicorn and the dragon into the Jewish tradition. This Ketubah is perfect for the couple whose passion, together, crosses these boundaries between reality and fiction, whose love of the literature of the mind goes hand in hand with their love for the Jewish traditions and, above all, each other. This Ketubah is close to our hearts, as the founders of This Is Not a Ketubah grew up as… AD&D fans.